I’ve been absent for a while, trying to make a decision about what to do with this website, but also because I’ve been reading a lot of non-fiction which I don’t read here. Here is a fiction review, at last! Today I’m reviewing One of Us is Lying by Karen M McManus. This was very nearly a disaster book because I struggled to get into the beginning. Thank god I persisted because it ended up fantastic! Something that surprised me, as usually, my first impressions are right. What’s the last book that surprised you? 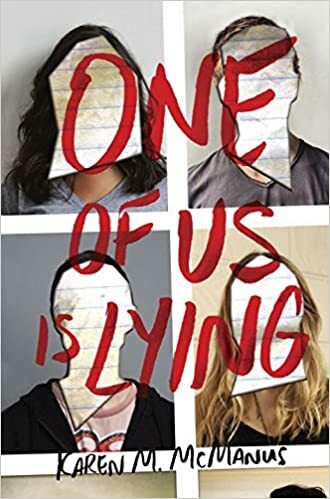 The Breakfast Club meets Pretty Little Liars in this story of what happens when five strangers walk into detention and only four walk out alive. Everyone is a suspect, and everyone has something to hide. The plot was good, I did kind of guess the ending, but that didn’t matter. But like I saw throughout this review, it didn’t matter because I loved the story. My biggest criticism for this book was the beginning, I think this is personal though and not a detriment to the story. I struggled to follow and keep up with the characters especially at the start because the story is told from four different characters POVs. One of the names (Addy) to my limited knowledge is unisex, that confused me, I thought it was a boy, it wasn’t. It was a girl. I think there is a trend in YA to avoid too many characters POVs because we millennials have limited attention spans! Or so they say. Nonetheless, once I got the characters, I flew through the book. It was a quick guilty pleasure type read and one of those easily demolishable in a night ones, something I love doing. Overall, this is an awesome high school whodunit with loads of teenage angst thrown in. What more could a YA-loving girl ask for? The characters are a little cliched in their social group archetypes but it’s okay, because once you get to know them you end up loving each of them and their floors. Well played to the author because their flaws were central to the plot and I LOVED that. Their floors made them suspects in the murder, so not only did we watch the characters grow through their arcs, we watch them get hung by the police for them too. There was a love story between two characters which given the characters was also kind of borderline between cliché and trope, but you know what? I freaking loved it anyway. I loved how it developed. I loved how it ended. I loved the arc of it, and the cute first love-ness of it (that’s totes a word). Not Guna lie, I swooned and sighed a little bit over their love story. The ending was awesome for so many reasons. I did see the murderer coming a little way out. But that didn’t matter because the explanation and how it came to bear was really well done, so I loved the ending anyway. I also did not see the side characters involvement till much later, right before it happened in fact so kudos to the author, it’s hard to pull the wool over my eyes these days so I am impressed. There was a point at the start of the epilogue where I thought I wasn’t going to get the ending I wanted, I was terrified after a great book that she had ruined it by not giving me what I wanted. BUT, I did!! Right at the final hour and my god was it satisfying. I won’t say anymore detail wise because it would spoil the plot. This is a super awesome high school whodunit, full of drama, angst and a little bit of love thrown in. The characters are well developed, I liked all bar one of them. The author has a lovely smooth voice that you slip into and before you know it, hundreds of pages have disappeared. Four stars overall, just because the beginning confused me. But I highly recommend this book. Sacha, your review-voice races along as breathlessly as I now imagine the book will do. Great review! I’m not particularly a YA fan, but the who-dun-it aspect does intrigue me. Thanks for sharing. Ooh sounds like one for my tbr pile! I struggled with Philip Roth’s American Pastoral… took me a month to read… and I’m still not convinced it was worth a month of my reading life, Pulitzer prize-winning novel or not!! !